April 11, 2014 — In setting good policy, it is important for policy-makers to be as well-informed as possible about the issues they wish to address and the effects of solutions they wish to implement. The New England Complex Systems Institute conducts advanced quantitative and mathematical analysis on questions important to well-informed policy, one of which is the results and causes of high food prices. Our research has demonstrated a connection between high food prices and global food riots and revolutions. 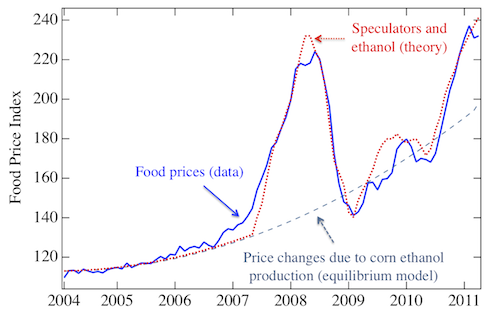 Our research has also shown that since 2005, the major drivers of increased food prices are the conversion of corn to ethanol and financial speculation in food commodities. Ethanol itself has led to a doubling of food prices and a condition of widespread hunger and desperation, in turn leading to social unrest. For 25 years starting in 1980, world food prices measured by the United Nations FAO Food Price Index hovered at a stable level, fluctuating no more than about 30% up or down. Around 2005 there was a shift in the global market and prices started rising. Within 3 years, by 2008, prices had more than doubled. In 2009 and 2010, prices receded somewhat, but remained at levels higher than any seen historically before 2005. In 2011, prices spiked sharply again, this time reaching even greater highs. When something as fundamental to human well-being as food changes price that quickly and that drastically, it creates a lot of stress, particularly on people who already live near the edge of subsistence.  During the second peak, the New England Complex Systems Institute examined the effects and the causes of this price behavior. We collected data from news reports on food riots and the civil unrest of the Arab Spring. Plotting these data over time against historical food prices showed a clear relationship (see the first figure in our handout). Using the FAO Food Price Index, we found a critical threshold for prices above which unrest becomes much more likely. The analysis suggests the doubling of food prices we have seen since 2005 pushed many of the poorest across the line from bare subsistence into desperation and starvation. When people are not able to feed their families, they have little to lose and become willing to take extreme actions. In 2008 more than 60 food riots occurred worldwide in 30 different countries, 10 of which resulted in multiple deaths. After the intermediate drop, even higher prices at the end of 2010 and the beginning of 2011 coincided with additional food riots, as well as the larger protests and government changes in North Africa and the Middle East known as the Arab Spring. We also investigated the cause of these price increases. Many factors were put forward in the literature as possible causes, including the rising cost of oil, increasing meat consumption (and therefore feed use for its production) in China and India, corn to ethanol conversion, and commodity speculation as well as others. Our analysis was able to rule out any important effects from all but corn to ethanol conversion, driven by the United States Renewable Fuel Standard, and the activity of speculators in the food commodity market. Using just these two factors, the demand due to the RFS on corn, and the impact of trend-following speculators, our model quantitatively matches the price dynamics from 2005-2012. The ethanol mandated by the RFS creates a demand (above and beyond the regular global food-use demand) that rises over time, causing prices to increase. On top of this, the herd behavior of speculators creates the large bubbles and crashes seen on top of the basic rising trend as the peaks in 2007/8 and 2010/11. Currently, the FAO index is at the boundary point of social unrest and has been there for almost the last 2 years, creating a context of widespread upheaval around the world which has undermined security and stability in many places. Some in the military refer to “the new normal” of simmering global unrest, but global unrest does not have to be the new normal. Our research identifies two clear policy actions that contributed to high and unstable food prices and global insecurity: implementation of the Renewable Fuel Standard and the deregulation of commodity trading. Policies to reverse these measures will substantially improve the global food price situation and consequently the global security situation. The effects of policy action can be powerful, broad, and sometimes unexpected and undesirable. It is important for policymakers to be as informed as possible about the impact, both intended and unintended, policy actions may have, because policy with unintended consequences is not good policy, regardless of your politics. Science can help, identifying what will be effective or ineffective in reaching goals, and identifying unintended consequences. The New England Complex Systems Institute has developed methods that are better able to identify and inform policies that work. In particular, the RFS has had clear, detrimental impacts on food prices, stability, and security around the world.